Concludes in the very heart of Copenhagen at Ved Stranden. While your cruise ship is docked in Copenhagen, make your way into the center of the city to start your 3-hour city sightseeing tour. 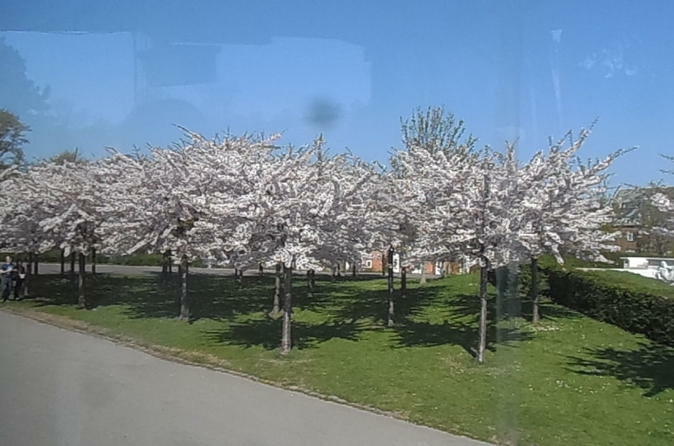 Hop aboard your comfortable coach and relax into your seat for your panoramic tour of Denmark’s charming capital. As you travel, listen to the informative audio commentary to learn the stories and secrets of the sights. Have your camera ready as you pass top Copenhagen attractions, including the iconic Tivoli Gardens. Opened in 1843, this amusement park is a Danish national treasure and famous for its nostalgic rides, antique wooden coaster and lush gardens. 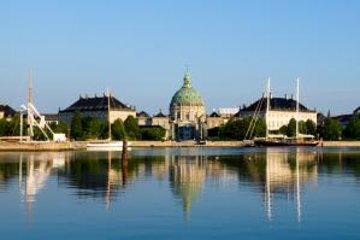 See the Amalienborg palace, the winter home of the Danish royals, and the stately art museum Ny Carlsberg Glyptotek. Swing by the splendid Gefion Fountain and take snaps of cobbled King’s Square, the city’s old central square with its equestrian statue of King Christian V.
After seeing the main sights, leave your coach at the former fish market, and board a sightseeing boat for your cruise around Copenhagen’s harbor and canals. Find a comfortable spot on board and admire the city skyline as you glide by the colorful harborfront. Pass the legendary Little Mermaid, the waterside statue inspired by Hans Christian Andersen's fairytale; and then cruise along the canals of the delightful Christianshavn and Frederiksholms districts. Admire the low bridges, colourfully painted townhouses and bobbing houseboats, and glimpse the serpentine spire of Our Saviour’s Church with its winding staircases — one of Copenhagen’s most iconic landmarks. After viewing the sights by water, step ashore at Gammel Strand, an easy stroll from Stroget, the city’s major shopping avenue. Please note: the start and end points of this tour are situated within walking distance of Copenhagen cruise port, allowing you to determine the time when you need to leave to return to the port. Please ensure your timely return to your cruise ship. Worry-free Shore Excursion: We will ensure your excursion finishes in ample time for you to return to Copenhagen port for your ship departure. In the very unlikely case that your ship has departed, we will arrange for transportation to the next port-of-call. If your ship is delayed and you are unable to join this excursion, your money will be refunded. See our terms and conditions for more details. Please note that you will be required to make your own way to the departure point of the tour. Great tour. Harbor cruise would have been better if it'd had been in English, as stated. THIS IS NOT IN WALKING DISTANCE FROM CRUISE SHIPS AS ADVERTISED. It would be two hours for a healthy young person. We took taxis and this added to the cost. Still, well worth it. great excursion. I loved it - best way to see Copenhagen. It didn't happen. You did not tell us where to make contact and no one knew where we could. You should give directions on the voucher, at least a phone number. Five tickets worthless. Very nice tour! I would do this again with victor!!! !